Filter dropdowns, which appear above the table. Filter widgets, which you can add to any widgetized sidebar. You can see both types of filter in action on our Product Table Filters Demo. Note: This page covers the options for letting customers filter the table to refine the list of products. If you want to create tables listing specific products based on category/tags/status etc. (i.e. perform a filter before the table first loads), check out this article. 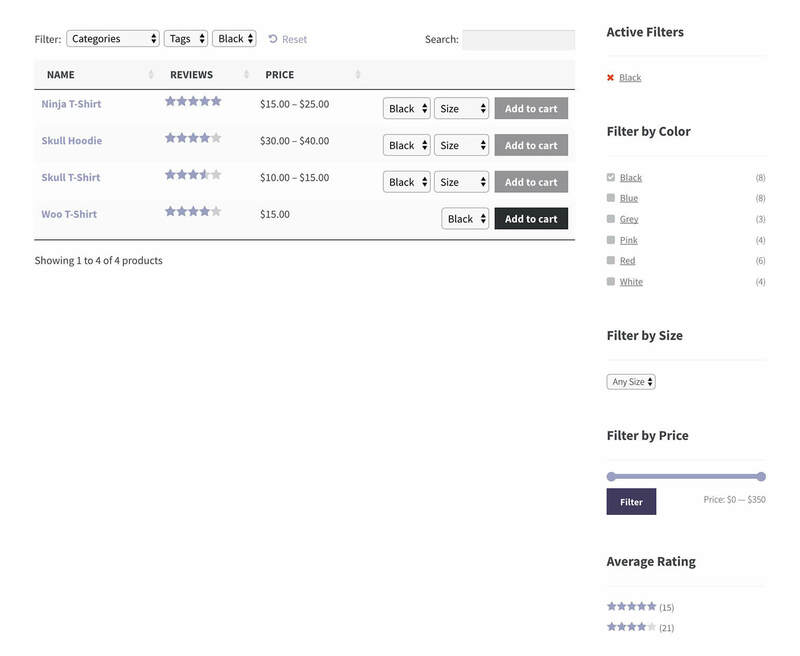 Please note that WooCommerce has renamed the filter widgets since the above video was filmed. The correct terminology is listed below. Everything else in the video is still correct. The filters option displays dropdown lists above your product table which let you filter (i.e. search) the table by product category, tag, custom taxonomies, attributes or variations. To show filters based on the contents of the table, set the ‘Product filters’ option to ‘Show based on columns in table’ on the plugin settings page, or add filters="true" to the shortcode. Any filterable column in your table, and any variations displayed in the ‘Add to Cart’ column (if variations are enabled) will be displayed as filters above your table. To specify which filters appear above the table, regardless of the columns displayed, you can list the filters to be included. To set specific filters globally on the plugin settings page, choose ‘Custom’ for the ‘Product filters’ option and list the filters in the ‘Custom filters’ box that appears below. You can use the keyword attributes in the filters option, e.g. filters="attributes". This will display all available product attributes so you don’t have to list them individually. These examples show you different ways of adding filters directly in the product table shortcode. Can I move the filters to below the table? The filters are displayed above the table by default, but if you have positioned the search box below the table then the filters will appear below the table. You can also set them to display above and below the table. Currently, WooCommerce Product Table lists all categories in a single list. The list is nested/hierarchical so that you can see which are the parent categories and which are child categories. We are interested to know if you would be interested in a new feature to list the parent and child categories as separate dropdowns above the table. Please send us a feature request if this is of interest. If there is enough demand then we will add this in future. If you are using lazy_load, then the filter dropdowns will show all possible options even if these don’t relate to the products in the current table. For example, if you are listing products in a specific category only then the ‘Categories’ filter will list all the categories in your store. This is because when you are using lazy load, WooCommerce Product Table hasn’t loaded the full content of the table and therefore doesn’t know which filter options apply to the current products. Depending on the number of products in your store, you can disable the lazy_load option. If you are not using lazy load then the filter dropdowns will only show options relating to the products in the current table. If you can’t disable lazy load due to the number of products in the table, then you could create a custom taxonomy and use this as a filter instead. For example, if you are listing clothing products in a table and want to add a categories filter for the clothing categories only, then you could create a ‘Clothing’ taxonomy and add each sub-category that you need to be able to filter by. You can then add a filter dropdown for this taxonomy, instead of using the actual categories filter. Can I control the order of the items in the filter dropdown? Most types of filter are ordered alphabetically and there are no options to change them. If you’re using the filters to list something where alphabetical sorting isn’t appropriate (e.g. dates), then you could add numbers before each item to control the order. For example, if you’re using categories to filter by month, then you could name your categories ’01 – January’, ’02 – February’, and so on. The only exception is attribute filters, which are sorted in a different way. Please see the separate instructions about ordering attribute filters in the product table. If your filters are not columns in the table, then there is no option to rename them. There is a hook in our developer documentation that you can use to do this. Can I add custom field filters? It’s not possible to filter by custom field because this is not how custom fields are supposed to be used. We recommend that you store this extra data as custom taxonomies rather than custom fields, as these can be filtered. Custom fields are designed to store unique data, and as such they’re not supposed to be filterable. In contrast, custom taxonomies are like categories and are designed to group and sort products. Please see our tutorial on how to create WooCommerce custom taxonomies. Can I add checkbox filters above the table? It’s not possible to change the dropdown list filters above the table to check boxes. If you want to add check box filters then you can do this using the filter widgets that come with the plugin, or using one of the compatible third party filter plugins recommended in this article. If you add filters="true" to the shortcode or select “Show based on columns in table” on the plugin settings page, then filters will only appear above the table if your table contains any filterable columns, such as categories or tags. If your table does not include any columns that can be filtered, then no filters will appear. Instead, please see the instructions above for choosing your own filters. If you’re trying to list attributes in the filter dropdowns (e.g. [product_table filters="att:size"] to list an attribute called ‘size’), make sure you have added your attributes globally Products -> Attributes. If you create attributes individually for each product then they will act in a standalone way and can’t be used to group products in the filter dropdowns. If you’re not using lazy load, then the category filters will only display when the categories have unique names. If you are using the same name for more than one category, then the only way to display them all in the filters is to enable the lazy load option. Product Table: Active Product Filters – Displays the active filters so customers can see which filters are already in place. Includes an option to revert the table to the original list of products. Product Table: Filter Products by Attribute – Filter the products in the table by selecting one or more attributes. Product Table: Filter Products by Price – Adds a price range slider. Customers can drag it to set a budget and view products within their price range. 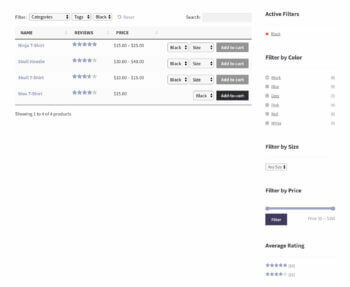 Product Table: Filter Products by Rating – Refine the product table to show products based on star rating. You can add the Product Table filter widgets to any widgetized area on your website, such as a left or right sidebar. They will only work on normal pages or posts that contain product tables. Choose the options to configure the product filter widget(s) as needed. The Product Table filter widgets do not work with product tables that you have programmatically added to the category archive template or shop template. This is because they only work on pages. Instead, you need to use the built-in WooCommerce filter widgets, which are designed to work on category archives. You can find these in Appearance > Widgets. They start with ‘Filter Product by’ instead of ‘Product Table’ (see screenshot). Can I perform a filter when the table first loads? If you want to create a product table that contains products with a specific category/tag/attribute/custom field or taxonomy/etc. only, please see our article on choosing which products appear in the table. You can also create product tables with a specific filter by including the filter value in the URL. For example, the URL https://producttable.barn2.co.uk/product-table-filters/?filter_color=black contains parameters for the attribute ‘black’. It will load a page of our demo site that is pre-filtered for products with the ‘black’ attribute. Similarly, https://producttable.barn2.co.uk/product-table-filters/?min_price=100&max_price=200&filtering=1 will create a table that is already filtered for products between $100-$200. You can get the URL’s by creating a product table with the filter widgets (instructions above), selecting the required filter, and copying the URL. Please note that if you are using option 2, then you can only link to filter URL’s for attribute, price or rating. If you want to link directly to a pre-filtered table using categories, tags or custom taxonomy terms, then you would need to use one of the third party filter plugins in this article. Both of these filter plugins provide the additional filters you need, and have unique URL’s for each filter option which you can link to. Can I use any AJAX filter plugins? The developers of 2 AJAX filter plugins have kindly integrated their plugins with WooCommerce Product Table. You can read about these in this article. We don’t know of any other third party filter plugins that work with product tables (e.g. FacetWP). If you can’t select your attributes from the dropdown on the Layered Nav widget, then this is because you have added them to individual products instead of creating them as global attributes. You need to add them as global attributes via /Products/Attributes. If you create attributes directly on the single product page then they won’t be available in the widget. Can I add category or tag filter widgets? WooCommerce also comes with widgets for ‘WooCommerce Product Categories’ and ‘WooCommerce Product Tags’. These aren’t filters because instead of refining the existing list of products, clicking on them takes you to the relevant category or tag archive page. If you’re using WooCommerce Product Table on a standard WordPress page, then you can’t use these widgets. If you’ve added product tables to your main shop page or archive template, then you can use these widgets. Clicking on a category or tag in the widget will take you to the relevant category or tag archive page, which will contain a product table. The other option is to use the WOOF AJAX filter plugin to add category or tag filters to your sidebar.